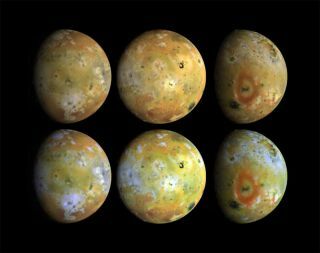 The Galileo spacecraft orbiting Jupiter returned these photographs of the Jovian volcanic moon Io in 1996. The red material on the surface is thought to be associated with recent volcanic eruptions. Jupiter?s moon Io is one of the strangest places in our solarsystem, with extremely tall mountains, foul-smelling gases in its tenuous atmosphereand incredible levels of volcanic activity beneath its surface. A new study of some of the chemical compounds present on theJovian moonIo has revealed fascinating new details about this peculiar world,researchers said. "It's an exciting place," said researcher ArielleMoullet of the Harvard Smithsonian Center for Astrophysics. "It's the mostvolcanic place in the solar system and as far as we know in the universe.It is unique." "These species are located very close to the main volcanic centers, which may suggestvery strongly that they are really driven by the volcanic processes,"Moullet told SPACE.com. She conceded the moon isn't a very pleasant place,though, because of the rotten-egg smell of the sulfur gases. In fact, it's impressive that the Jovianmoon can hang on to these wispy gases at all. "What is special about Io is, it's pretty small so it'ssurprising it can retainan atmosphere," Moullet said. "It's as big as our moon, so that?swhy people are looking for what is the main source of this gas." Scientists think the atmosphere is tied to the intensegeologic activity on the moon, which is spurred by Io's relatively shortdistance from Jupiter ? they are separated by about 260,000 miles(420,000 km) ? and Jupiter's humongous mass. Jupiter exerts tidal forceson Io, much as Earth's moon does on our planet and vice versa, that tug at Io'snear side stronger than at the far side. The tidal forces cause layers of Io beneath the surface tomove and rub against each other, creating friction that heats up these layersand melts magma that erupts in volcanoes. The volcanoes spew out material that tends to freeze quicklyafter reaching the surfaceof Io, because its temperature can reach as low as minus 298 degreesFahrenheit (minus 183 degrees Celsius). Over time, the sulfuric ice layersublimates, or transitions directly into a gas, to create the moon's tenuousatmosphere. The intense geologic activity is also responsible for Io'stowering peaks, including some mountains taller than Mount Everest. The researchers hope this mysterious place gives up evenmore of its secrets in the future when more powerful instruments and betterimagery is available. In particular, a proposed joint NASA/European Space Agencymission to Jupiter and its other moon Europa called EJSM (EuropaJupiter System Mission), could offer up-close views of Io, too, if it islaunched in 2020, as proposed.